Medical treadmills line has been designed to be used at health- care facilities and physiotherapy wards. 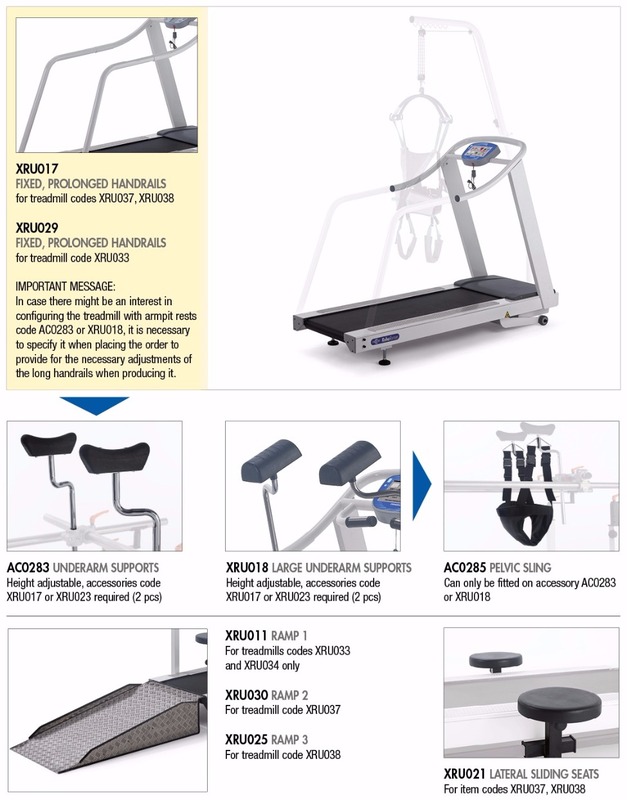 This LINE includes 2 configurables treadmilles range for rahabilitation: RehaRunner 01 and RehaRunner 02. Treadmills for fitness, ideal for gym and sports training.They are provided with backlit exercise computer with 3D Matrix Display and reclining function. Space-saver - stores vertically. 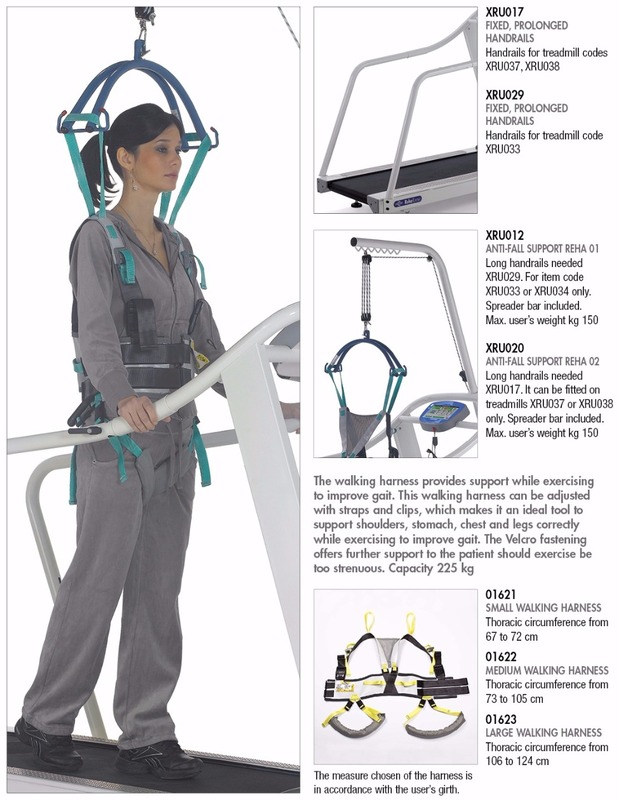 Our treadmill line has been designed to be used at health-care facilities and physiotherapy wards. 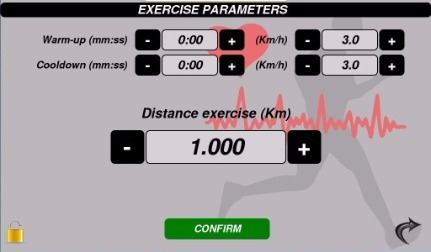 They are powered by a main supply, and they have a console to set speed, tilt as well as for displaying some features such as heartbeat, duration of the exercise and the distance covered. 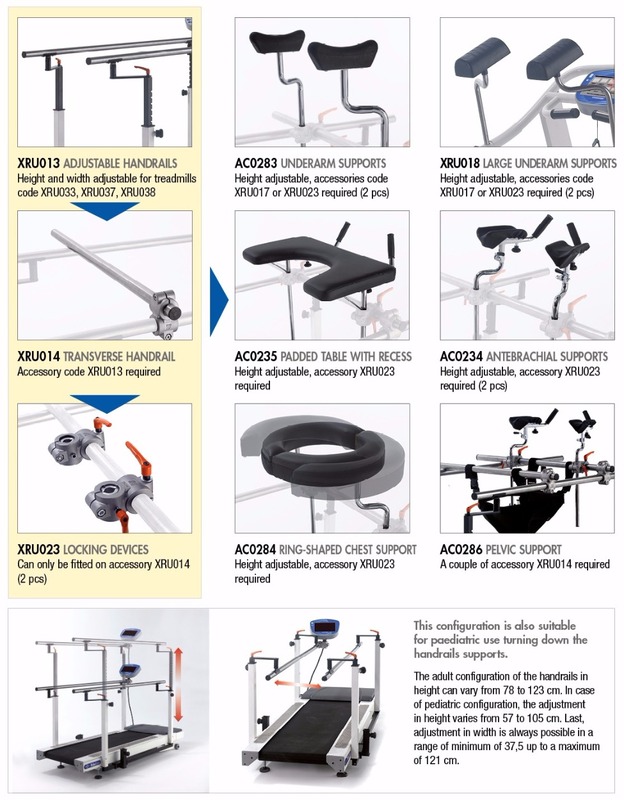 It is worth highlighting the manual function, which allows the carer to have freedom of setting the parameters mentioned before in order to customize the type of exercise. 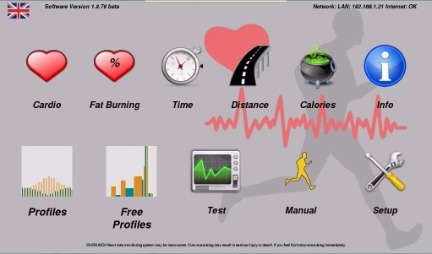 It is necessary to set beforehand all the patient’s data and then go on to set a kind of exercise in consideration of any of the following parameters, that is to say, time, distance, or calories. Once the patient’s data have been set and the main work parameter has been chosen it is possible to set the warm up and cool down periods. There are 10 types of tests for the patient already pre-set, and they are especially practicle for measuring different stress tests in accordance with the objective to be reached. 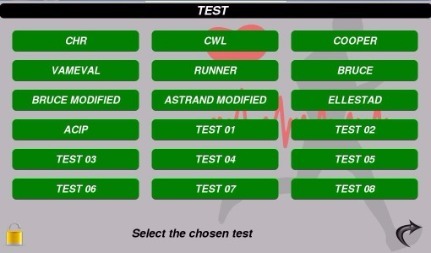 For example, the CHR test (Constant Heart Rate) and the CWL test (Constant Work Level), which allow to carry out a type of exercise at a constant heart rate. Another test called RUNNER allows to carry out an exercise with an increasing load increasing the speed at 1 km/h per minute rate. The COOPER test allows to carry out an exercise to assess the maximum distance covered in 12 minutes. Furthermore, it is possible to set the test conditions manually by the carer. The additional test conditions are 8, and the procedure is the same as for registering a free profile. 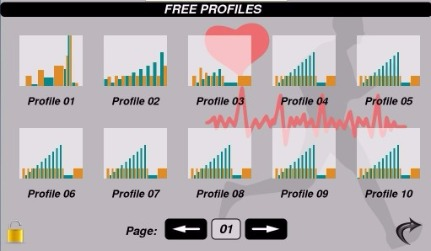 There are 10 basic profiles available directly from the main menu. Furthermore, it is possible to set and memorize some exercises in a customized manual mode for a group or for single patients, since there are 100 free profiles. The saved profiled can be called out by using the arrows forward and backward and by choosing it on the touch-screen display. The most moder generation of treadmills include the two-way direction of the movement. Which means that is possible to go forward or backwards by pressing, when standing still, the button “forward” or “reverse”. The maximum backward speed has been limited at 5 Km/h, and it can be set to be lower. Reverse walking can be disabled. 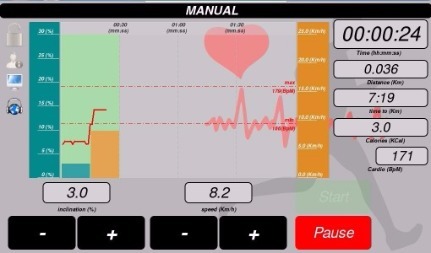 All parameters are displayed while carrying out an exercise with the aid of a graphic representation which shows specifically speed and tilt with green and orange columns while the heartbeat is displayed with a red zig-zag line. 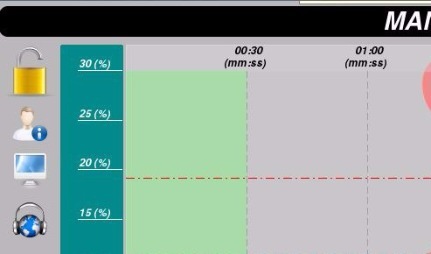 Two other dotted lines show minimum and maximum rate of heart pulse set for the patient treated corresponding to his or her personal data. A group of icons can be always found while carrying out an exercise. They can be found in the upper-right part of the screen and they offer some specific functions, as for example, locking the work setting of the treadmill in manual version or with a given profile or test condition. 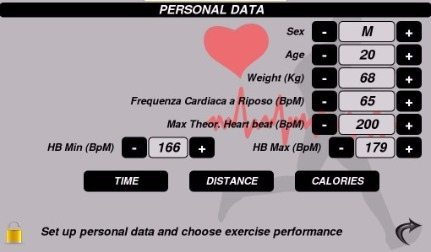 Also for the call-out function of the patient’s personal data, which must be registered before the beginning of any exercise, the TV function to watch multimedia channels via internet or to play videos from a USB support, and last the RADIO function to listen to channels or play music from a USB support. The software is multilingual and the measure unit for the distance covered can be set either in miles or in kilometers. Remote control from a pc or ECG is done via an RS 232 cable included. Upon request, a pc software for a control of the walk could be provided.